CHARLOTTE, NC. 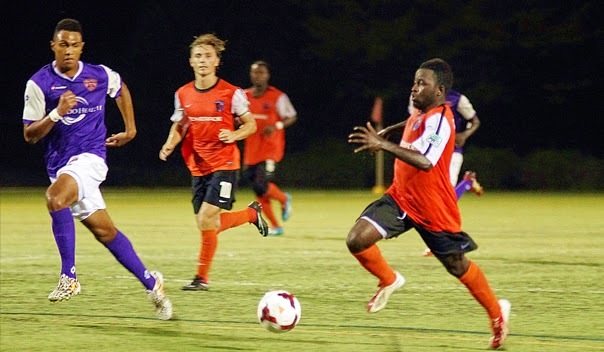 – Despite creating several threatening chances and dominating possession throughout tonight’s match, Orlando City SC (16-3-4, 52 points) fell to the Charlotte Eagles (9-13-3, 30 points) 2-0 in a physical road contest. After a scoreless first half, Eagles’ Midfielder Wells Thompson scored a brace in the latter portion of the second 45, resulting in Orlando’s first-ever loss to Charlotte in 10 outings. City’s two previous matches against Charlotte this season at ESPN Wide World of Sports came in the fashion of 3-1 and 4-1 wins. With Charlotte sitting deep in their own half, Orlando’s notable possession-oriented style of play was highly visible in the first half of tonight’s match, as the Lions repeatedly tried to break through the Eagles’ defense. City’s first clear-cut chance came in the 18th minute when Forward Corey Hertzog produced a booming strike from distance, forcing Charlotte Goalkeeper Alec Kann to leap and make a finger-tip save. As the half progressed, Orlando continued to put Kann and the Charlotte backline under pressure with a flurry of attacking plays. In the final 15 minutes of the half, Orlando produced three quality efforts on goal, including a near-finish from da Luz that hit the post. Unfortunately for Orlando, Charlotte’s ability to sustain the Lions unrelenting attacks would pay dividends for the North Carolina-based side in the second half when Wells Thompson opened the scoring in the 72ndminute. The midfielder’s driven effort from the right-side of the box ricocheted off the post, leaving Gallardo with no opportunity for the save. City responded immediately by pushing forward in search of the equalizer in hopes of preserving crucial road points. However, Thompson was able to capitalize on a counter-attack when he notched his brace deep into stoppage time. How's Orlando City's MLS squad looking like?